Nothing succeeds like success. This second remake of A Star Is Born changes the setting from the world of Hollywood filmmaking to the concert stage, more than likely to showcase the singing talents of both its stars: Barbra Streisand and Kris Kristofferson. And showcase them the film does, for A Star Is Born plays less than a movie and more like a concert film, making it feel much longer than its two-hour running time. Oddly, that is the least of its problems. Rock superstar John Norman Howard (Kristofferson) fronts the John Norman Howard Speedway. Habitually late, drunk, who does a little coke on the side, he is hardly worth the trouble. However, he draws the big crowds, even if they have to wait two and half hours for him to show up. Impulsively, after a show he goes to a bar that coincidentally has a trio performing: The Oreos (two black women, one white woman in the middle). The chanteuse is Esther Hoffman (Streisand), who is irritated that Howard, whom she seems to know of but not know, keeps distracting from her act. A fight breaks out between him and a fan (a pre-Freddy Kruger Robert Englund) and she helps him escape. Soon, he whisks her away to a day show, but he makes a fool out of himself by taking a motorbike and flying off the stage. Esther is horrified and a bit lost in this chaos. Eventually, they find each other again and begin a relationship both professional and personal. John gets her to perform at a benefit, where her powerful vocals wows the audience. Their romance eventually leads to marriage and collaboration, including the song Evergreen, technically a duet but with so little participation from John that Esther shouldn't have bothered having him in the recording studio. However, despite the fame Esther is gaining, she'd rather be in their Southwest ranch house, or at the least, do a joint tour. John knows he's a disaster and that their styles don't mesh on a joint tour, so he begs off. Howard tries for a comeback, but his band, now calling itself Freeway, is doing its own thing. All this leads him to go on a bender, where he crashes her Best Female Performance Grammy Award speech and makes a spectacle of himself. Esther begs their old friend to help him in his comeback, and he tries but John won't budge from being against letting his comeback be a 'Greatest Hits' type with his new material. Eventually, John Norman Howard dies in a car crash listening to Esther Hoffman, and after some time grieving, Esther Hoffman Howard returns to sing their songs once again. A Star Is Born makes one of the worst decisions by focusing so much on Streisand's singing that eventually it becomes too much of a good thing. Streisand is one of the greatest voices of the Twentieth Century, and the songs in A Star Is Born are quite good. However, a lot of the film soon starts playing as if it were a Barbra Streisand Special. The film ends with her singing, all in apparently one take, where we never cut away from her. It smacks of vanity project and becomes almost ripe for parody. And that's not including the rather cringe-inducing idea that the trio would call itself 'The Oreos', or that Streisand trying to belt out soul music seems so wildly misguided. Another massive issue is the total lack of chemistry between Streisand and Kristofferson. A Star Is Born wants us to believe they fall madly, passionately in love, but in many scenes they don't appear to even like each other. 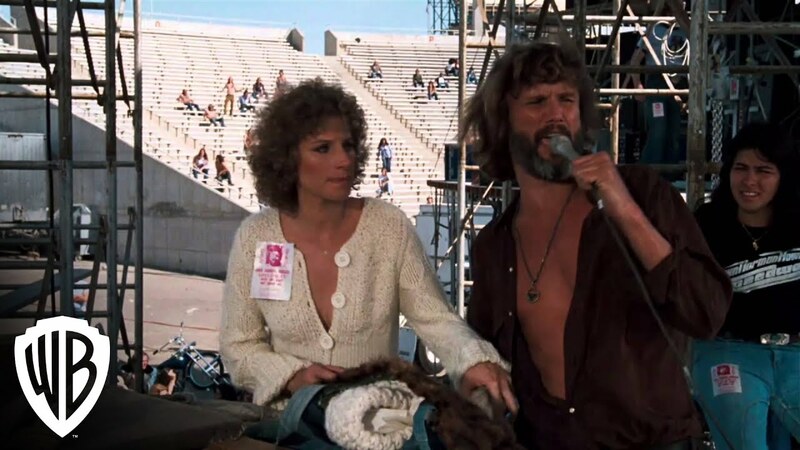 You've got Kristofferson doing some oddball Jim Morrison impersonation and you've got Streisand doing something else. It's generally not a good sign when the music attempts to sell the idea that these two are lovers and the actors themselves cannot do that. Oftentimes, they actually looked a bit bored and forced as they went through the motions. Going a bit further into the performances, Kristofferson acted as though the film is called A Star Is Dying given how often he seemed disengaged from things that didn't involve his 'self-destructive rock star'. Part of that is not entirely Kristofferson's fault, as a lot of the film focuses on him: his drunken stage performances, his shooting of a helicopter by an obnoxious frenemy DJ, Bebe Jesus (played in a wildly over-the-top manner by real-life DJ M.G. Kelly). It gets to where you wonder why they bothered throwing Esther into this. However, the pivotal scene when he crashes her Grammy speech comes across as stiff and unenthusiastic, the drama flopping badly. Streisand, I think, does what she can. She does have one effective moment after John dies, when listening to his tape recording she yells at his voice in anger and hurt only to break down and beg his forgiveness. Apart from that moment, however, she seems similarly more concerned with her singing than her acting. When she discovers John in bed with a really whacked-out reporter, the 'fight' is more hilarious than shocking. Same for when John flies off his bike twice: at the concert and at his ranch. As a side note, the film is so 1970's as to be weirdly nostalgic. See Rita Coolidge and Tony Orlando cameo as themselves! 8-Tracks! It is kind of funny that essentially, rocker John Norman Howard died while listening to Barbra Streisand. The singing is what saves A Star Is Born from being a sheer and total disaster. I'm not talking about Kristofferson's John Norman Howard Speedway. That kind of arena rock is just crap and painful to listen to. It's when Streisand sings that the film picks up. Yes, there's the iconic Evergreen, a beautiful number that is all that A Star Is Born isn't: lush, romantic, beautiful, well-crafted. You also have other numbers, such as Woman in the Moon, Lost Inside of You (a rare duet between Streisand and Kristofferson that works) and I Believe in Love. The music is great. It's just about everything else that's lousy. Done in by bad performances and endless concert scenes, A Star Is Born has no drama, no romance, but it does have Evergreen, so there's that.